Why is this Copa America special? It’s a celebration of CONMEBOL’s 100th anniversary. How long does it last? 3-26 June. Who’s hosting? USA, 10 host cities. How many teams are there? 16, from two confederations (CONMEBOL/CONCACAF). What’s the qualifying system? Four groups of four, top two from each group advance to quarter-finals. In the Caribbean, Haiti are widely considered as one of the strongest teams – regularly reaching the Caribbean Cup finals and qualifying for the Gold Cup. At the Copa 100, though, they’ll be quite the opposite. Seen by many as the underdogs in Group B and indeed the whole tournament, Haiti can afford to play with relative freedom without a huge deal of pressure put on them. But as we’ve witnessed in the past – particularly at last year’s Gold Cup – the underdog tag could well work in their favour. One of the main concerns surrounding the team is their lack of productivity in front of goal. They’re yet to score in fourth round WCQ, sitting bottom of Group B with just one point which was picked up against Panama in March. Clear-cut chances have been at a premium as forward players haven’t been delivering. They will have to take more risks and throw more bodies into the box at the Copa 100 to try and put an end to this drought. Patrice Neveu has only been in charge for five months and already some Haitian fans are frustrated with the Frenchman. The 62-year-old’s team selections and tactics have been scrutinised, with the marginalisation of striker Duckens Nazon a particularly contentious issue. Nazon is a big hit with the fans following his excellent contributions in the Gold Cup as he netted two goals in group play, helping Haiti reach the last eight for the first time since 2009. He was unavailable to play in the Copa 100 playoffs in January because the game against Trinidad & Tobago didn’t fall under a FIFA date. The rumour is that Neveu was disappointed about Nazon’s absence and subsequently benched him for March’s WCQ doubleheader vs Panama. It’s unlikely that Neveu will start him in the USA, much to the annoyance of many fans, going with the more established No 9 Kervens Belfort instead. Les Grenadiers’ final 23-man squad features players based in the USA (6), Europe (13), Asia (2), South America (1) and Haiti (1). It’s a diverse and competitive squad with an average age of 26. There’s plenty of pace, athleticism and physicality as well as some flair in attacking areas – Wilde-Donald Guerrier and 2015 #CaribYoungStars picks Jeff Louis and Derrick Etienne Jr (listed as a reserve) are prime examples. Haiti are likely to set up in a 4-5-1 shifting into a 4-3-3 when on the attack. A fair amount of emphasis will be placed on the wide men who’ll be expected to track back and contribute defensively. But, crucially, they’ll have to capitalise on any counter-attacking opportunities when they arise. The Haitian FA arranged two warm-up games leading up to the Copa 100. On Wednesday they dispatched semi-professional American club Miami Dade FC 4-1 at their training base, IMG Academy. Kim Jaggy, Belfort (2) and Kevin Lafrance got in on the act. Then on Sunday, Haiti face much stiffer competition in fellow Copa 100 participants Colombia in Miami. The friendly should attract a fair amount of Les Grenadiers supporters due to the large Haitian diaspora there – indeed, Miami is sometimes referred to as ‘little Haiti’. This will give Neveu a final opportunity to fine-tune his squad ahead of kick-off vs Peru in Group B’s opener. This is the starting line-up that I’d like to see. DEFENCE: Johnny Placide is the captain and so picks himself, while I’ve gone for tournament experience over youthful exuberance across the back four. Both Jaggy and Reginal Goreux offer more know-how than their full-back counterparts Alex Christian and Stephane Lambese respectively. While the latter two undeniably possess better recovery speed which is always helpful during one-on-one battles, it is difficult to overlook the importance of past tournament experience on this occasion. Jaggy started at left-back (and scored!) in the friendly against Miami Dade FC which is perhaps an indication that Neveu intends to use him there for the Copa 100. Should he start again on Sunday, then we shall have something more conclusive. I know Neveu is an admirer of Lambese and he is a good prospect, but Goreux has more respect within the squad and is the safer option at right-back. As for central defence, Romain Genevois and Mechack Jerome provide a strong enough partnership. The latter is particularly effective from free-kicks as demonstrated in WCQ third round play. MIDFIELD: I’d have Jean-Marc Alexandre sitting just in front of the back four, shielding and screening. James Marcelin provides aerial presence and athleticism while Soni Mustivar – the only MLS player called up by Haiti – is a dynamic midfielder capable of getting on the ball and dictating play. With those three there’s a nice balance to midfield. ATTACK: On Wednesday, Neveu predictably employed Belfort as the central striker but he was flanked by Nazon and Guerrier. I’d actually start Nazon as the main centre-forward – granted, he’s not had the best of seasons at club level with Laval but as demonstrated at the Gold Cup and temporarily in WCQ, the 21-year-old carries a genuine goal threat and is capable of producing something magical at any moment. He also has a point to prove to Neveu. While Jeff Louis can be infuriating at times, when in the mood he can be unplayable. There’s no denying his ability on the ball but Louis will have to run back, mark up and cover his full-back to prevent Haiti getting horribly exposed out wide. Will he sacrifice his maverick style for the collective betterment of the team? We shall see. On the other flank, it was a toss-up between Guerrier or Jean-Eudes Maurice, formerly of Paris-Saint Germain and now based in Vietnam. For me, Guerrier possesses slightly more class and his end product is better. He’s left-footed, too, so can swap with Louis as an inverted winger out on the right. Whoever does play up front, the service to them will need to be good quality and the ball will need to stick. After all, Haiti are expected to defend for large periods and any opportunity to clear, get up the pitch and receive respite will naturally be taken. In reality. Lambese —> Goreux, Max Hilaire —> Marcelin, Belfort —> Nazon. 4/9 points. Beat Peru, lose to Brazil and take a well-fought point against Ecuador. Too optimistic? Maybe, but stranger things have happened. Indeed, Jamaica enjoyed a brilliant summer last year: making their debut at the Copa America and becoming the first Caribbean nation to appear in the Gold Cup final. Sure, they were defeated 3-1 by Mexico in the final but their very presence there put a much-needed squeeze on CONCACAF’s status quo. Yet their form has slipped since and a spot in the Hex looks unlikely. The Reggae Boyz were on the brink of facing an embarrassing third round WCQ elimination when they lost at home to Nicaragua, but a late, late second-leg strike from Simon Dawkins gave them a 4-3 aggregate victory. Their fourth round campaign has so far been underwhelming – losing to Panama, beating Haiti and then drawing/losing to Costa Rica. So the Copa 100 represents a temporary change of scene and a chance to build some momentum. Similar to their Caribbean counterparts Haiti, the Boyz have been struggling to find the net. In fourth round WCQ, they’ve registered just two goals across four games (Clayton Donaldson vs Haiti, Jean-Vaughn Watson vs Costa Rica). In last year’s Copa America they failed to score in their three group fixtures, albeit against Uruguay, Paraguay and Argentina. Good goal-scoring situations were created but not tucked away. Donaldson is expected to lead the line with Giles Barnes playing off him; the pair will have to strike up a quick understanding. The former is a target man and back-to-goal type striker, but also a willing runner who will work hard for the team. Barnes was on the whole very effective at last summer’s tournaments and he’ll need to reproduce the same type of form this time around. Waiting in the wings are Allan Ottey – cousin of Jamaican nine-time Olympic sprint medalist Merlene Ottey – and Dever Orgill, who is based in the Finnish top-flight with IFK Mariehamn. The 26-year-old made his international debut in 2010 and is relishing the chance to don the Boyz jersey again, following a lengthy hiatus from the national programme. Simon Dawkins can operate as a forward if needed, too, although he is best utilised out wide or in the hole. A reminder that Darren Mattocks is sidelined with injury hence his omission from the final 23. Winfried Schafer has included six domestic-based players in his final 23-man squad: Rosario Harriott (Harbour View), Andrew Vanzie (Humble Lions), Damano Solomon, Michael Binns (Portmore United), Allan Ottey (Montego Bay United) and Chevone Marsh (Cavalier). Harriott is a tall defender who made his international debut in a friendly defeat to South Korea last year. Vanzie first appeared for Jamaica in 2011 but is now making a mini renaissance six years on. Aggressive defender Solomon and midfield all-rounder Binns were key for their club in 2015/16. Pacy striker Ottey was a member of last year’s Copa America and Gold Cup rosters. Marsh, meanwhile, finished top scorer for his club last season with seven goals from attacking midfield. Nicknamed ‘Messi’ for his dribbling and low centre of gravity, he is currently out on trial with a Finnish side and is reported to return in time for the Copa 100. Significantly, though, making an appearance in the USA would represent a big step forward for these players. Many of them are seeking a professional deal abroad and realise that scouts from all over will be tuned into the Copa 100. If they can get on the pitch and impress, then who knows what opportunities might follow further down the line. On Friday, Jamaica will line up against last year’s Copa America champions Chile in Vina del Mar. The Jamaican delegation arrived earlier this week and have been conducting technical/tactical training sessions in preparation for the game. Team manager, Roy Simpson, told the press that mainly local-based players will be assessed and the result isn’t the number one priority. On a side-note, defender Jermaine Taylor is the only member of this current Boyz squad that featured in a 0-1 friendly defeat to Chile back in 2007, the first and last time the two sides met. 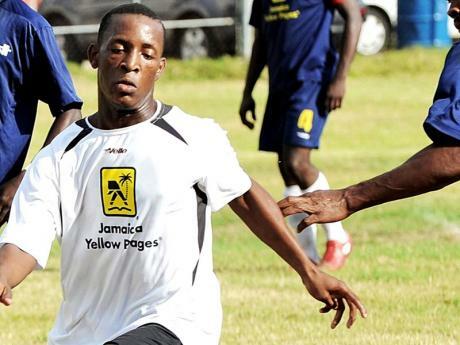 Three days later Jamaica will face USA fourth-tier club Boca Raton FC in Florida. Although the opposition won’t be as challenging, it’ll still serve as a good run-out for the Boyz and give Schafer another chance to see his players in action ahead of kick-off vs Venezuela in Group C’s opener. This is the starting line-up that I’d like to see. DEFENCE: Philadelphia Union shot stopper Andre Blake has to be first choice in between the sticks, but Ryan Thompson and Duwayne Kerr are competent backup. The back four includes MLS and Premier League pedigree, most notably Wes Morgan, who is fresh from captaining Leicester City to the Premier League (PL) title. He became the first Jamaican to win the PL and the first Caribbean international to captain the PL champions. He’s in the form of his life and partnered with Michael Hector, central defence looks a very strong area. Alvas Powell is unavailable due to injury so Adrian Mariappa is the next best choice at right-back – he is typically a substitute for Crystal Palace but is always a solid, steady player for Jamaica. Kemar Lawrence supplies plenty of drive and energy down the left. Named in the Team of the Tournament at last year’s Copa America, Lawrence enjoyed an excellent debut season with New York Red Bulls but has gone off the boil in 2016/17. He’s a fantastic player, though, and I’ve got full confidence that normal service will be resumed at the Copa 100. Taylor, meanwhile, is an experienced and steely defensive replacement should one of the back four pick up a knock. MIDFIELD: One of the biggest contributing factors to Jamaica’s ascent to the Gold Cup final was the central midfield work of captain Rodolph Austin and Je-Vaughn Watson. The duo worked in tandem to protect the back-line, break up play and feed the forward players. Austin is an almost definite starter; his leadership, passion and commitment will be needed, especially when things aren’t going entirely Jamaica’s way. Watson plays more of a defensive role at club level with FC Dallas, however, he excels in central midfield internationally and there’s no obvious reason not to start him. Lee Williamson can provide backup, while it would be nice to see Vanzie and/or Binns receive minutes at some point. The wide positions are pretty easy to forecast: Garath McCleary wide right, Jobi McAnuff wide right, and rightly so. McCleary missed the last two WCQ encounters vs Costa Rica because of injury so he will no doubt be raring to go. McAnuff, although one of the older members of this squad, is a tremendous worker and an intelligent footballer. The two usually carry out their defensive duties very well, but it is important that their attacking contributions aren’t blocked because of too much focus on defence. ATTACK: I’ve gone with Barnes as the No 10 as I feel he’s more effective there than up front by himself. He’ll have to work closely and link up with Donaldson, getting the ball out wide to McCleary and McAnuff when possible. Marsh and Dawkins are versatile attacking options, capable of deputising for Barnes in behind or playing out wide. As mentioned earlier on, Ottey and Orgil provide striking competition for Donaldson. In reality. I can’t actually see Schafer making any personnel changes to that starting line-up. Perhaps Morgan will take the armband ahead of Austin and Barnes will be pushed up higher in a 4-4-2, but that’s about it. 6/9 points. An opening win over Venezuela, surprise Mexico and lose to Uruguay. Again, this is an optimistic outlook but if they can replicate last summer’s performances, securing two wins isn’t so inconceivable. Interest lecture about Haiti and Jamaica, the information that provide you is concret and probably to happen, i´m not agree with the prediction of Jamaica, 6 points out of 9, because they beat Mexico, maybe that could be a draw or a win for the Mexican squad. It´s nice to see someone that is commited to the Caribbean football and hope to see more info about Copa Centenario here.